There was a beautiful animal print comforter with matching sheets and pillow shams that I had my heart set on. To buy the complete set was expensive, however, and I was saving for it, hoping that it would go on sale. Finally, the department store was having a white sale, and although this particular bed set wasn’t in the catalogue, I hurried down to the store to check on it. There it was! One of the showroom beds had been made up with my comforter set: comforter, dust ruffle, satin sheets, shams and throw pillows all in beige, brown and black leopard designs. It was beautiful! Excited, I eagerly rushed to the cashier’s stand and asked the woman if it was on sale. Her attitude stopped me cold. Never looking at me and moving very slowly, she sighed and picked up the sales catalogue. “No, it doesn’t look like this one’s on sale. Sorry.” And she turned away. Hopes diminished but not dashed, I went back to look longingly at the beautiful bed set and thought about what I could do to get it to be on sale. The saleswoman I had talked to was clearly not interested in helping me. She was one of those people I call “bench warmers”—there to put in the hours required, doing as little as possible while they are there. They don’t care about their work or you. I knew I needed a different kind of salesperson. Did one exist in this store? “That’s such a beautiful comforter, isn’t it?” My eyes widened as I turned my head to look at the lovely woman who stood beside me. Yes! She had on a department store name tag. I knew immediately that this was a real saleswoman, a “player.” She had seen me staring at the bed set and could feel that I wanted it. With one comment, she had let me know she admired my taste, asked me a “tie-down” question (sales lingo for a question that automatically elicits agreement), created a sense of rapport, let me know she had time for me, and seemed available and willing to help. Maybe there was a sale in my future after all! Get a different salesperson, get a different answer: “Is it on sale?” I asked, innocently. “I’m sure it must be,” she said, “Let me look and see.” She reached up to the sign that listed the prices for the different items, and behind that sign was another one that listed sale prices. She told me that the sale didn’t really start for two days, so the sale prices weren’t posted yet, and she offered to take my store credit card number and ring it up first thing in the morning the day of the sale. “Great!” I said. “Which items would you like?” she asked. “I’ll take everything!” I answered. She made an $800 sale. I also asked to see her manager and told him in great detail how wonderful she was. Thanks, Lillian Sellahewa, at the Macy’s store in the Fox Hills Mall. Find a salesperson like that. Or be one like that. 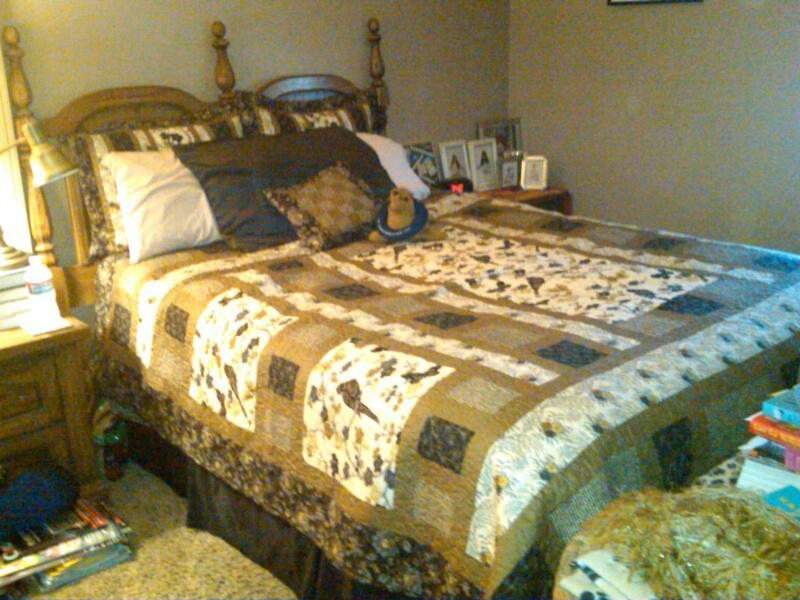 I held on to that beautiful comforter for many years. It’s tough to let go of things you love that also have a history. But it’s gotten rather dingy and worn, and I started thinking about a new one. My roommate, Shelley, had gotten a quilt hand-made for her by a lovely woman named Kerry in Temecula, and I thought maybe I’d get one made for me. So on a trip to Pechanga, we once again went to visit Old Town and look in the antique stores and have lunch. So we naturally stopped by the quilt shop, and there was Kerry, bright-faced and smiling. Behind her on the wall was a gorgeous quilt in black and white with gold and brown accents featuring birds. I just loved it! Now this quilting store is for hobbyists, they don’t usually make quilts for people, but Shelley had talked Kerry into it for hers, so I pointed at the quilt on the wall and said, “Would you make that one for me?” She grinned and said, “Yes, of course,” and we happily browsed through the store, gathering materials for my quilt, plus two shams and a pillow to match. She agreed to get back to me with the pricing and we went off to Pechanga. She called the next day, said she had made a mock-up of the quilt (because I needed a larger one than the sample), gave me a price and invited us back to look it over, approve the design, and give her a deposit. On our way out of town, we stopped by to look at her beautiful mock-up and she threw in the shams and pillow as a gift. I was delighted! Life can be an endless series of “I can hardly waits” if you plan it right.